A Review of Marnie by Jane McChrystal. During the month of June the media were saturated with coverage of the return of Poldark to BBC1 for a fourth series. The success of this most recent adaptation of Winston Graham’s series of novels for TV owes a lot to the handsome Irish actor, Aidan Turner, in the leading role of Captain Ross Poldark. His attempts at scything shirtless in the first series whipped up as much hysteria as Colin Firth’s emergence, dripping, from a lake in Andrew Davies’ version of Pride and Prejudice, which occupied the same popular Sunday night slot in 1995. Captain Poldark first appeared on our screens in 1975 played by Robin Ellis who, like Turner, proved a very popular choice in the role. Despite Winston Graham’s important contribution to the recreation of his hero for a TV audience and a long career as a best-selling author, he is a rather shadowy figure today. Like many writers, his childhood was marred by illness, but he recovered and went on to serve his writing apprenticeship with the financial support of his mother until his first novel was published in1934. He lived a long life and wrote fifty two novels admired by the public and literary establishment alike. He was happily married to Jean, who inspired him and helped with writing the novels. His two children, Rosamund and Andrew, remembered him with affection and went on to lead successful lives of their own. The reason for his current state of obscurity is partly attributable to his dislike of fame, but with no early struggles for financial survival, no scandals, no drink or drug hell and no disaffected sons or daughters to spill the beans on a childhood of neglect and abuse, there hasn’t been much to excite the attention of the press since he died at the age of 95 in 2003. Even one of his 30, non-Poldark novels, Marnie 1, is remembered much better as the film directed by Alfred Hitchcock. 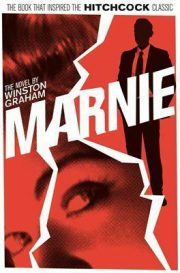 Made in 1964, with Tippi Hedren and Sean Connery in the leading roles, Marnie tells the story of a mysterious woman who assumes multiple identities in order to steal money from her employers and the man who hunts her down, Mark Rutland. Many critics view Marnie as one of Hitchcock’s most disturbing movies, where he exposed a bit too much of his own weird predilection for sexually unattainable blondes through his direction of Hedren. Despite opposition from his screen writer, Evan Hunter, Hitchcock refused to cut the notorious honeymoon scene where Hedren’s doe-eyed, fragile Marnie is raped by her new husband, played by Connery with all the menace of a panther bringing down its prey. We now know from her own account that Hitchcock’s treatment of Hedren in Marnie, was just one episode in a twisted artistic relationship which he used to frighten and torment her. For example, he insisted on filming her being attacked by live birds when lifeless, mechanical models had been used in other scenes in his post-Psycho shocker, The Birds. She also claimed he spied on her in her dressing room and, on one occasion, launched an unsuccessful sexual attack, as well as ordering other workers to shun her on set, increasing her general sense of unease both on and off it. While Graham’s Marnie is the object Mark Rutland’s fascination, he is more obsessive scientist, concerned with the psyche of woman-kind in general and Marnie in particular as an especially fascinating exemplar, than sadistic hunter. Graham’s Mark is compelled to discover what drives Marnie to a life of deception and crime rather than destroy her, although the methods he employs might end in the same result. Marnie was written by a 53 year old male author of middle-brow fiction in 1961, so naturally, it is sexist and somewhat misogynistic. I found the convoluted plotting of the second half of Marnie, where Graham plays cat and mouse with the reader, much as Mark does with Marnie, somewhat tiresome, but that’s the kind of reader I am. That said, Graham’s portrayal of a woman, whom we might now describe as a sociopath, shows us how she thinks and why she acts as she as she does, and in doing so, invites us to understand rather than pass judgement. We are constantly reminded of the keen intelligence which enabled her to rise from her position as dirt-poor inhabitant of Plymouth in the 1940’s and 50’s, to that of the smart, respectable employee who is trusted to manage substantial amounts of cash by her bosses. She has good looks and a cool demeanour, but these characteristics do not define her. Instead she uses them to distract men from her single-minded pursuit of their money. Graham helps us to see how a mother’s abuse can foster a malign attachment in a child which is unbreakable and will dominate the rest of her life. Marnie’s mother was in the grip of a fanatical brand of Christianity which she used to justify her cruelty and distort young Marnie’s view of herself. He shows how war wreaks havoc on family relationships and poverty devastated lives in the years before England became a welfare state. Poor Marnie, deprived of the capacity to love others by her childhood experiences, she can only dream of a life of luxury where want and fear will be banished forever. Her anxieties and aspirations are all recounted in a flat, affectless voice which betray the bleakness of her inner life. Graham’s compassionate eye is one of the reasons why it’s still worth looking at his work today. There is also his talent for creating complex female characters like Marnie and Demelza of the Poldark novels. His daughter recalled how her mother Jean’s attention to detail and excellent memory influenced Graham’s work, which must also have enhanced his ability to create women who don’t just embody the usual polarities. As for Marnie, there is clearly something timeless in Winston’s anti-heroine, which continues to inspire artists to this day. And so, a new operatic interpretation, composed by Nico Muhly with a libretto by Nico Muhly which made its debut at the ENO last November, will be staged at New York Met in October this year. Why don’t people write like Winston Graham anymore? The Twentieth Century abounded with authors like him, who could tell an enthralling story, played out by psychologically coherent characters caught up in the most important social and political dilemmas of their time. Some say Netflix does the job these days. A few years ago it was all, apparently, being done by the writers of Corrie and East Enders. Even if either of these assertions were true, we seem to have lost something of immense value, which could still pull in a wide readership today, if publishers were prepared to risk the investment. I bet the potential authors are still out there too. Viv Albertine: A Review of Two Memoirs by Jane McChrystal. The power of creativity: combining art and fashion in Florence, by Carla Scarano.